The historical revolt against the Republican government of Spain, Spanish Civil War was a conflict for the world’s superpowers such as Germany, Italy and Soviet Union to be involved which was between the Nationalists led by General Franco and the Republicans. The Civil War started in 1936, with a three-year lasting conflict that ended with a Nationalist victory and the establishment of General Franco’s dictatorship which continued until his death in 1975. Although the proclamation of the republic in 1931, the land owners and the church took every opportunity to cause an unrest in the country. When General Franco led a coup attempt in 1936, his forces faced with an unexpected armed resistance of local people. 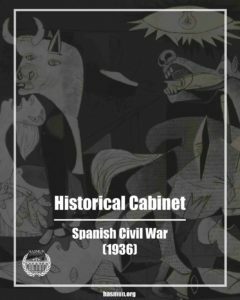 In Spanish Civil War, the Cabinet’s skills will be tested whereas members of the cabinet will have an unforgettable experience, feeling the tension of that horrible and chaotic time.